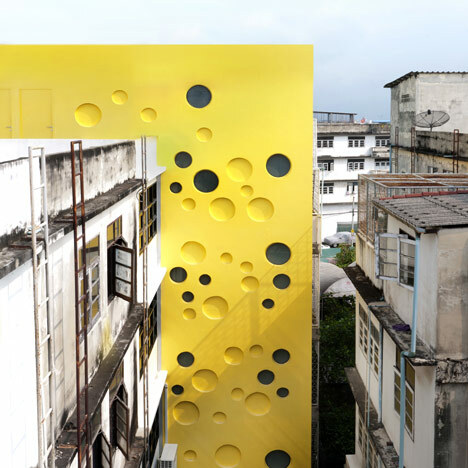 Architects Spark have added a stairwell resembling a giant wedge of Swiss cheese onto two Bangkok shophouses they've converted into a youth centre. Commissioned by Thai bank TMB, the Fai Fah centre provides the venue for a programme of workshops and classes that encourage children and teenagers to take part in creative activities. During the design process the architects held design workshops with local children, who had the initial ideas for the steel lattice that covers the facades of the two original shophouses. "Spark’s workshops with the Fai-Fah children were inspiring," explained TMB Bank's Paradai Theerathada. "They gave the children a great sense of accomplishment from being involved in the design process for such a large-scale, tangible project." The children also chose a palette of colours to mark each of the building's six storeys, including the bright yellow that features in the event space and mezzanine gallery at the base of the building. Other rooms include a library, an art studio, a pottery classroom and a dance studio. A garden is located on the roof, where the L-shaped stair tower wraps around to create a storage room. Long, narrow shophouses are a typical building typology in Southeast Asia, and we also recently featured one converted into a residence with a swimming pool inside. Photography is by Lin Ho, apart from where otherwise stated. The design was developed at interactive workshops with the Fai-Fah children and teenagers, volunteer arts staff, and members of TMB’s CSR team. Ideas generated during the workshop such as the façade screen and the interior colours were incorporated into the design, underlining the positive nature of the collaborative process and ownership of the concept amongst all of the project's protagonists. The five levels of the building are linked by a central feature staircase with each level defined by its own colour theme. Utilities and services are housed in a new inverted L- shaped structure, the "Utility Stick", which is plugged into the rear of the building; it rises from the courtyard and bends to form a garden store at roof level.